wherever you are in the country wearing the color blue for the cause. In order to highlight the growing need for concern and awareness about autism, the Autism Society has been celebrating National Autism Awareness Month since the 1970s, according to the group’s website. 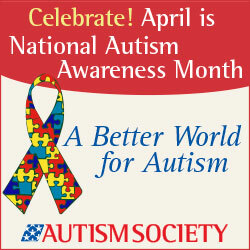 The United States recognizes April as a special opportunity to educate the public about autism and issues within the autism community. Autism appears to have its roots in very early brain development. However, the most obvious signs of autism and symptoms of autism tend to emerge between 2 and 3 years of age. It affects 1 in 68 children and 1 in 42 boys. Parents can see the list of early signs of autism and typical developmental milestones that their child should be reaching at either the Autism Society’s website: http://www.autism-society.org at the Autism Speak’s website: http://www.autismspeaks.org.